The seventh surah of the Quran is called: The Elevated Places. There are several points and stories in this chapter that are interesting to discuss with children. In this surah it is mentioned that Allah (s) destroys cities with people who are doing bad things. Discussion Question: can we think of any city that was destroyed because of the bad things people did? What does Allah (s) do to warn people about a punishment that is coming? It is mentioned in this chapter that Iblis refused to bow to Adam (a) because he thought that fire was superior to clay. Discussion Question: why did Allah (s) ask the Angels to bow to Adam (a)? Why did Iblis refuse? There is a description of The Fall and Allah (s) admonishes us to avoid the mistake of Adam (a) and Eve (r). Discussion Question: what was the mistake of Adam (a) and Eve (r)? In this chapter we are asked to dress in beautiful elegant clothes for prayer. Discussion Question: how are we supposed to dress when we pray? Why? The creation story is reviewed in this chapter: the light of the Prophet (s), the heavens, the fire and Iblis, the waters, the land and animals, and then Adam (a). Discussion Question: why do you think Allah (s) created things in that order? There is a review of the prophets that warned their people and the punishment that followed. Discussion Question: how did Allah (s) warn the people of Pharoah? After the believing people left Egypt there were several miracles like the parting of the Red Sea and the 12 springs of water. Discussion Question: when Allah (s) sends a miracle what is the responsability of the believers after that? 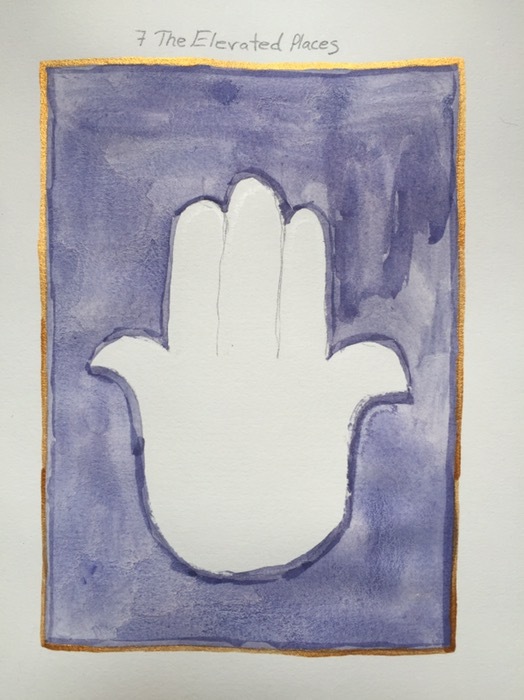 Illustration: in this illustration I used a hybrid of two ideas, the white hand of Musa (a) and the hand of Fatima (r) to symbolize the warning brought by the prophets. This particular idea I credit to The Story of Moses (a) by Karima Sperling.